We have free spins on the Wish Master slot machine for all new players right now. 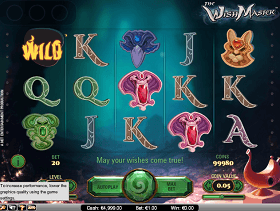 The Wish Master is the latest slot machine from Net Entertainment and we like what we have seen from it so far. The Wish Master himself pops up each time a scatter symbol shows up on the screen. Then you can be awarded with different multiplier´s and wild symbols. The game got some nice sound effects and we like the graphics as well. Since we have a free spins offer on this slot maybe we don’t need to say to much, try it out for yourself. We are happy to tell that we now have a free spins offer on The Wish Master. The offer is exclusive for the visitors of Free-Spins.org so make sure you use the bonus links for registration. The offer will be valid until July 4th 23:59. Its 10 free spins that you will be able to enjoy directly after you register as a new player, no deposit required. So a good way for new players to try both Comeon casino which is the place where we have this offer and also try the brand new slot machine. Players from the following countries will be able to enjoy this free spins offer; Holland, Sweden, Norway, Finland, UK, Australia, Austria ,Belgium, Canada, Chile, Germany, Iceland, Ireland, Luxenbourg, Monaco, Switzerland. Some of the countries we mentioned already have a standard offer in the country sections above, this means that you will get the regular free spins and the Wish Master free spins on top of that. If you dont have a country section up there then just use the bonus link down below.